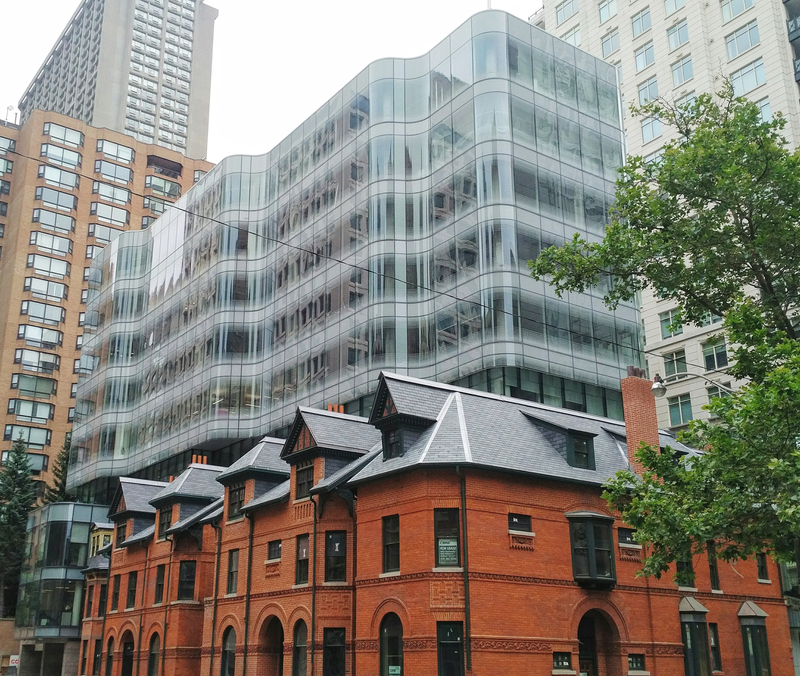 7 St Thomas integrates a sleek, undulating fritted-glass mid-rise office building designed by the prominent architectural firm Hariri-Pontarini Architects, with a block of heritage townhomes. The site inhabits a transitional zone between the intense luxury retail and corporate fabric of Bloor-Yorkville and the quiet, leafy collegiate campus to the south. 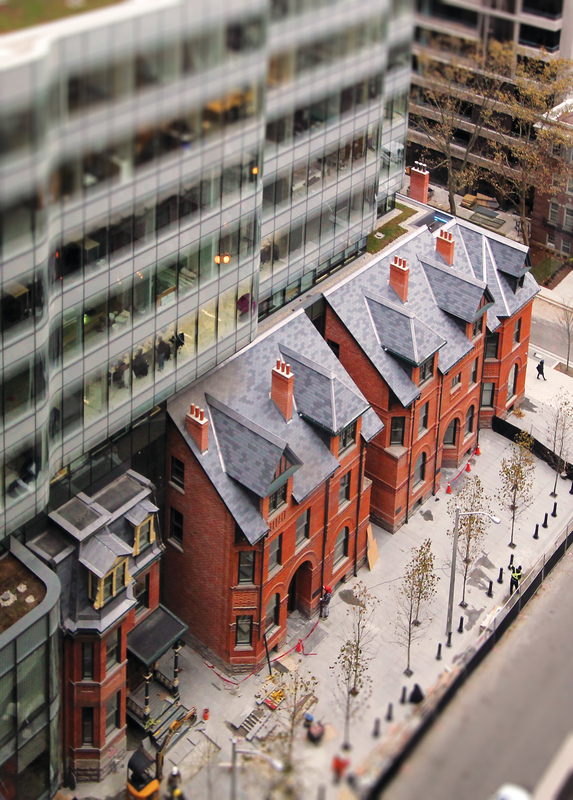 ERA was responsible for the full array of Heritage Consultation services, from Heritage Planning reports and approvals, through all Design and Construction Phases. Our tasks included: documentation, conservation and reconstruction drawings and specifications, design input and coordination for the complicated retention structure, protection measures, reintegration with the completely new concrete structure, and contemporary components like curtain wall systems and green roof. 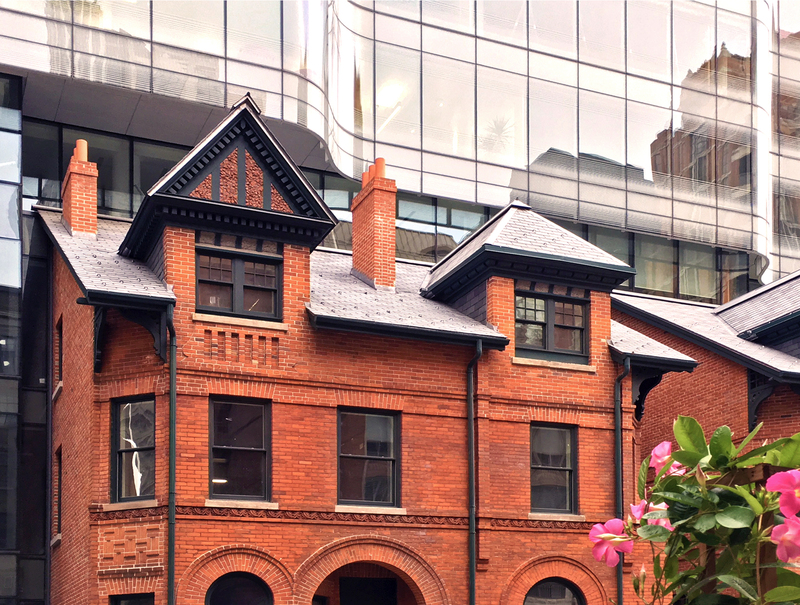 The late 19th-century three-storey red-brick houses are excellent examples of the Romanesque Revival style. 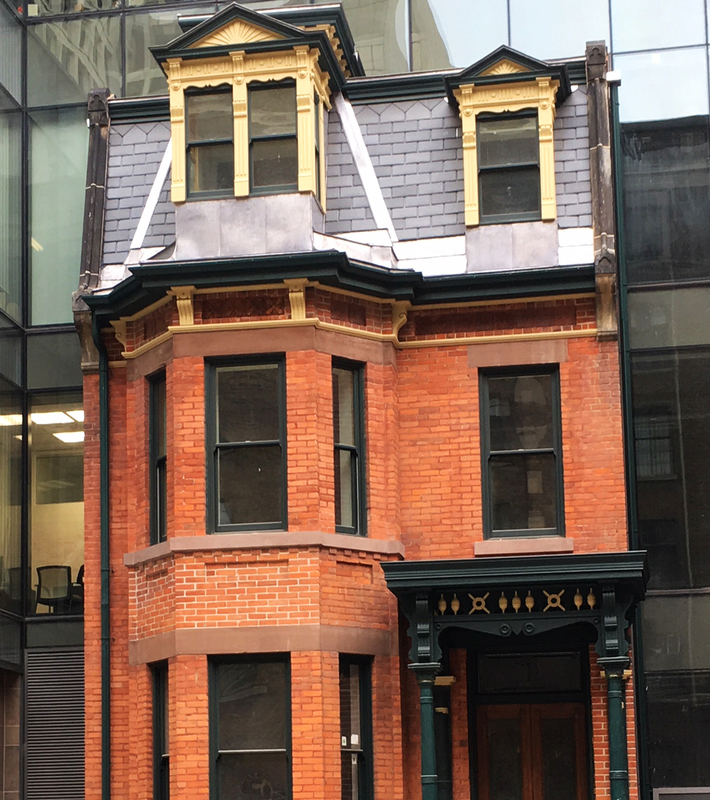 Restoring the charm of the masonry, windows, trim, dormers and sloped roofs was challenging, not because of the conservation required, but due to the integration of the interior spaces and quality of construction that had to be seamless between the different envelopes. Providing modernized assemblies and fire protection necessitated a degree of invention. All of the complicated wood roof forms were precisely recreated with light-gauge steel framing with, often minute adjustments to allow for the flawless re-installment of catalogued and restored original exterior trim and detailing. All wood exterior elements were primed with fire protective coatings. The resulting image of a convincing rehabilitative conservation project conceals the high-performance envelope put in place. As with any successful modern retail space, the entrances for the ground level necessitated thoughtful approach to universal accessibility measures. ERA composed modifications to the original entries that provided passive and inclusive accessibility while mitigating impact to the heritage character of the buildings.